Same Day Packaging Delivery Available. 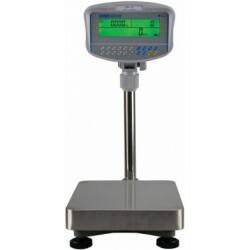 The Adam GBC Scale is a fully featured counting scale with numeric keypad for unit weight and sample entry. The bright large backlit display shows unit weight, total weight and number of pieces. A grade 304 stainless steel top pan with mild steel base and pillar mounted ABS plastic indicator, make the GBC a durable industrial floor counting scale. All of our prices are shown Inclusive of VAT and Free Shipping to MOST UK Mainland addresses, however, some Bulk Buy items, deliveries to offshore addresses & a very small number of Northern Scottish Postcodes will incur a shipping charge or surcharge, please see below, so no nasty surprises for you at the checkout! Please note that we cannot deliver to PO boxes.